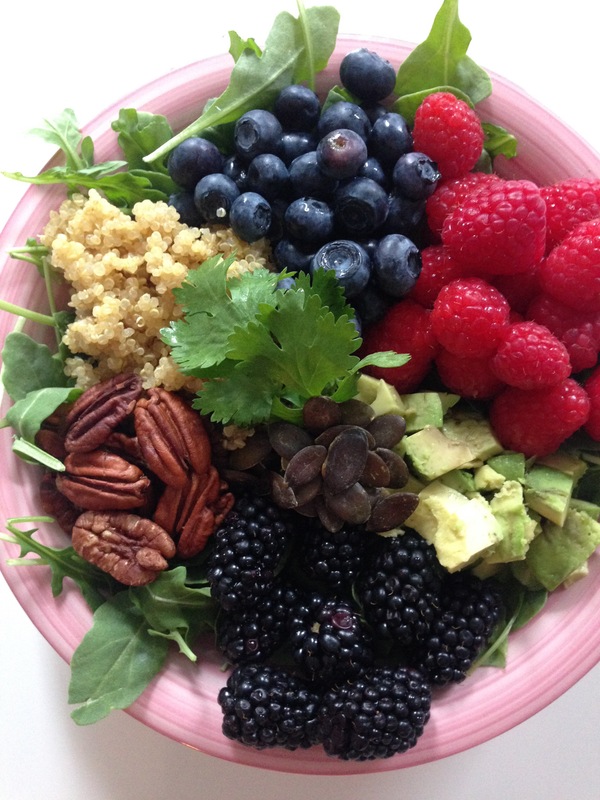 They say we eat with our eyes first, and this salad is looking mighty fine! 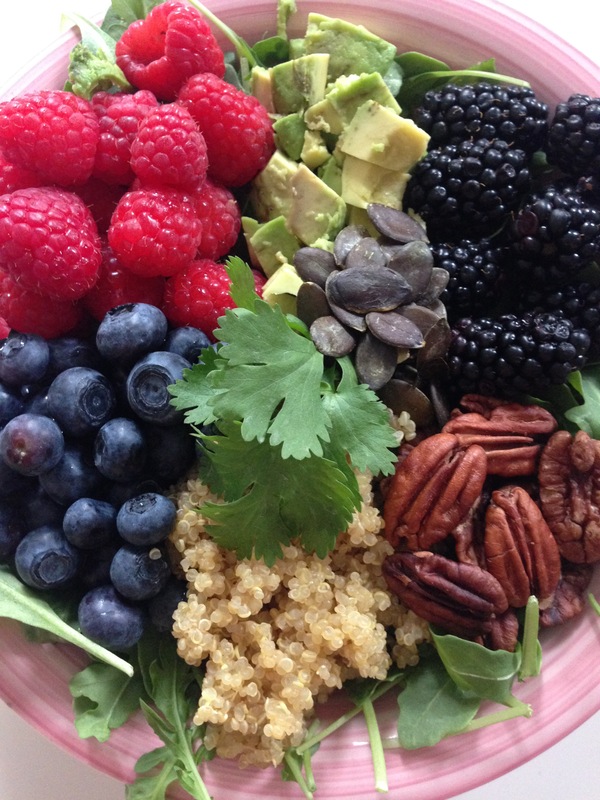 Your eyes, taste buds and body will all love-love this salad. And with the bounty of gorgeous summer greens and berries available, why the heck would you not put summer on your plate? This salad is so beauteous, it will most probably illicit lots of “oohs” and “ahhs”. 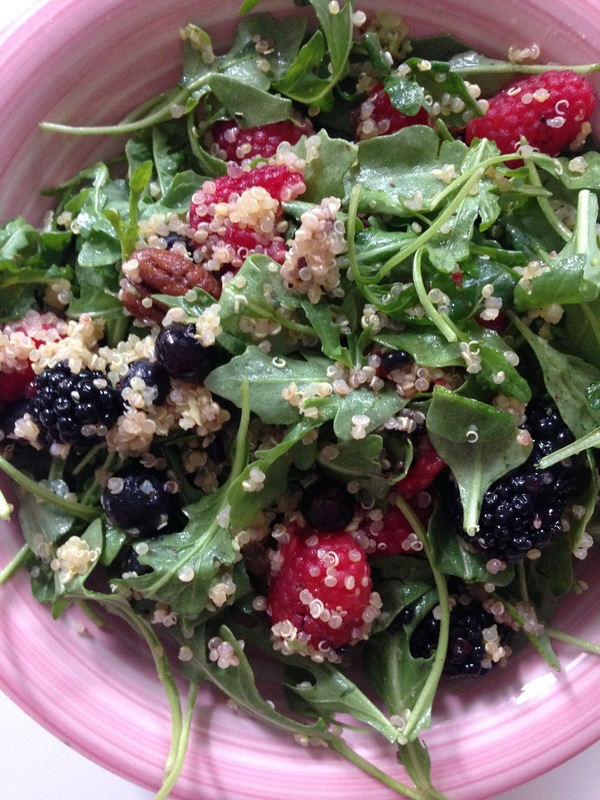 Since I’m not partial to picking just a few ingredients, I’ve included all my favourite ingredients in this salad: plump raspberries, bursting blueberries, succulent blackberries, crunchy pecans and pumpkin seeds, fluffy quinoa, delicate roquette and velvety avocado. The array of produce in this salad makes it extremely nutrient-packed, packed with protein, omegas, fibre, antioxidants and low-glycemic carbohydrates. This salad is incredibly energizing as most of it is no-cook, except the quinoa, which I decided to cook in vegetable broth for a little extra flavour. Combine all ingredients in a large salad bowl – or keep ingredients separate as in above picture for presentation purposes. Drizzle with olive oil and vinegar or citrus juice. This glorious salad will steal your heart. This salad is such a perfect summer dish–all the raw freshness and nourishment of season. Niki, What kind of vegetable broth did you use to cook the quinoa? I don’t think I’ve ever made a vegetable broth before. Does that broth include any kind of salts or seasonings?